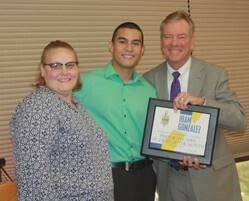 The PTK Student of the Month is Iram Gonzaelez. Iram is the son of Nancy and Isaias Aquirre and a graduate of Dodge City High School in Jetmore. Iram serves the role, in Phi Theta Kappa, as Kappa Psi chapter President. Some of his other accomplishments include; achieving fitness goals in cross-fit, he earned his 1st stripe in Brazilian Jive Jitsu and became a member of Dodge City Police Academy. Gonzaelez’s GPA is 3.9 and is majoring in criminal justice. Upon graduation from Dodge City Community College, he plans to transfer to Wichita State University or Fort Hayes State University, where he undecided but wants to become a leader.